Over the past 2 decades, the annual cost of college education is rising steadily and the level of student loan debt has accelerated to a jaw-dropping $1.35trillion in America, which is spread among 45 million people, as per recent statistics from the New York Federal Reserve. 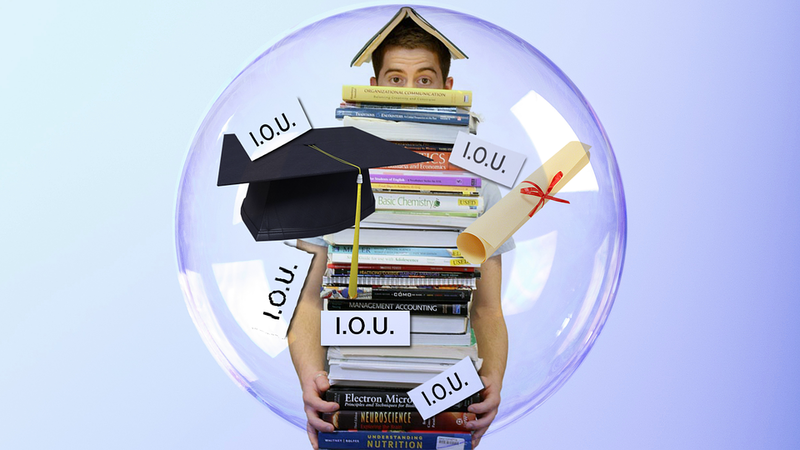 The study ranks student loans are the second largest debt, the largest being mortgage debt. This shows that student loan debt is even higher than credit card debt and auto loan debt. It is surprising to note that there are considerably large numbers of borrowers who go through a tough time in repaying their student loans and it is also noticed that 15% f debt is more than 90 days delinquent. If you want to reverse this worrying trend, you have to imply a clear financial strategy. Here are few budgeting tips to follow if you’re struggling with your student loan debt. You have to be angry with the debt that you accumulated while studying. You shouldn’t feel comfortable with the debt that you accumulated in college as this will make you delay about taking action against it. Once you reach the ultimate level of infuriation, you will be hell-bent to pay it down and become debt free as soon as you can. If required, opt for second jobs or federal programs or debt forgiveness programs through which you can chuck off a portion of the debt. If you think that the budget is not a worthy option, the 20-30-50 plan can be one of the most flexible ways of accounting for your expenses. Initially, make sure you keep aside 20% of the take-home pay towards your financial future. Here you could use that money to direct it towards paying off the loans. Next, allot 30% towards wants/fun like eating out or going for parties with friends. Ultimately, spend 50% of your income on the essential expenses like rent. Irrespective of the debt that you’re carrying, if you don’t pay yourself, you’re committing a huge blunder. In case you earn a decent amount of money, make sure you stack aside 10% of your month towards your debt payments and another 10% towards savings. Keep track of it and whenever you get extra funds, increase the payments. When you aren’t tracking your finances carefully, it’s easy for you to spend more money. You should ideally track all expenses, even those that you have paid in cash. The best way is to automate your savings and checking account so that a portion of your funds get deduced from your account. This way you can continue with saving even though you may forget. Even after you follow the above mentioned steps to follow a budget when you’re struggling with the student loan payments, you should still avoid taking on additional debt. Owing too much of debt at a very young age can bar you from taking out new lines of credit in the near future. Students seeking financial assistance to attend college have many options. Ideally, you have some money set aside and your parents are willing and able to help you pay for a college education, but if you still need money for tuition, books, and living expenses, there are a variety of loan options available to you. Here are a few different types explained. The most common type of loan that college students receive is a direct student loan, which is granted by the federal government (through the U.S. Department of Education) when students apply for federal financial aid through FAFSA (the Free Application for Federal Student Aid). Within this category, there are Stafford loans, federal plus loans, and consolidated loans. There are two types of Stafford loans: subsidized and unsubsidized. Subsidized Stafford loans are so named because they are government subsidized, which means the Department of Education pays the interest on the loans while you’re in school (at least half-time), for six months after you graduate, and during a deferral period. In addition, subsidized federal loans are based on financial need, with the amount determined by your school. Unsubsidized loans do not require you to prove financial need, but your school still determines the amount, factoring in the cost of attendance, as well as any other financial aid you already receive (i.e. grants, scholarships, etc.). Also, you’re responsible for all of the interest accrued on your loans. This type of direct loan is intended to cover the gap in expenses not already paid for by other types of financial aid (grants and Stafford loans). These loans are still federal, but they are based on credit score and may have less favorable terms for repayment, although the interest rates are still low. Students may take out several loans throughout the course of their college career. This type of direct loan consolidates all of these student loans into a single loan so that students paying down debt need to only make one payment. While this loan program falls under the scope of federal loans, it is actually administered by individual schools and granted only to students with extreme financial need. For this reason, Perkins loans are not nearly as common as, say, Stafford loans. Suppose you’re unable to receive all the funding you need for your school expenses through federal financial aid. If you can’t earn enough at a job or gain other funding through grants and scholarships, you’ll have to look for another source of funding. Luckily, you can also take out student loans from private lenders to make up the difference and meet all of your financial obligations while you’re in college. Just keep in mind that private loans have very different terms, so make sure you understand the loan agreement. Gradually it’s getting tougher and tougher to graduate from college without taking resort to student loans. About 75% of the recipients of bachelor’s degree leave their school not only with a degree but also with huge amounts of debt. Research reveals that the humongous amount of $1.2 trillion in student loan debt is playing a role in preventing the Americans from making any type of big purchases which drive the growth of the economy. Not many are being able to buy new homes to rent an apartment only because they have huge amounts to pay back on their student loans. The student debt crisis has in fact become so huge that it has even gained attention of the presidential candidates who are watching out for different ways in which they can make college affordable by reducing college and tuition costs. Approximately, around 40 million Americans with student loan debt are desperately looking for ways to manage debt. After reading such gloomy student loan debt statistics, you must be looking for something positive. Well, students are lucky enough that there are so many new programs which are being brought into effect in an effort to relieve the borrowers from debt. Here are some developments to take note of.
? The REPAYE Program: This program was introduced in 2016 as along with the income-based repayment programs. The REPAYE or the Revised Pay As You Earn programs provides assistance for repayment to a supplementary of 5 million borrowers each year. Borrowers can easily cap the student loan installment in a month to around 10% of their discretionary income. Those seeking help of this program can have their remaining balances waived off or forgiven after they have been making timely payments for 20 years. However, the amount forgiven is taxable.
? Loan repayment assistance is now a workplace benefit: As per a study from the SHRM or Society for Human Resources Management, around 3% of the US employers have started offering loan repayment options as a part of employee benefit. This number will most likely grow as more and more employers start understanding the importance of this benefit. Almost more than half of the respondents of a survey said that student loan assistance was better than 401(k) contribution match.
? Refinancing options sponsored by state: As federal benefits are done away with and eligibility criteria tightened for the large number of graduates, more states now started offering student loan refinancing options for the borrowers in debt. Through their new SELF Refi program, residents in Minnesota with debt could be able to refinance at rates which are as low as 3%. By offer state help, students might just waver from seeking help of private loan options.
? Get On Your Feet Loan Forgiveness Program: This is yet another one-of-a-kind loan assistance program offered on the state level. The Get On Your Feet Loan Forgiveness Program has started in New York and the program provides up to 24 months of debt relief to college graduates who live in the state and meet few eligibility requirements.
? A hope for a new President: It has been unanimously acknowledged that President Obama made a number of changes to the landscape of student loans during his terms. With the 2016 presidential elections, people can again expect a new President and along with him a set of new policies for the students. Though it is unsure about who is going to serve the nation, yet all the Presidential candidates have shared their student loan reform plan. Federal student loan refinancing, reducing loan rates are some changes that would definitely be included. We have to leave it on time to know whether or not the above mentioned changes will remain or disappear but for now the students have definitely been given easier ways to pay off their student loan debt and live a debt free life. When we look back on university, we often remember the challenge to get good grades. We completely forget about the challenges of handling money effectively or the issue of paying for everything we need. In some cases, this will be because our parents paid for most of what we needed. Or, because we were lucky enough to get a scholarship for our chosen course. However, the cases of this are fewer than most people realise. For many, college is not just an academic challenge. It is a continuous financial struggle. That’s why you need to know how to deal with the greatest expenses during college and after you graduate. If hall accommodation is included in your college fee, you might want just to stick with that. However, if you need to find your own accommodation after your first year, you may want to think of options that will reduce the cost considerably. First, you can think about moving back home, if it’s not a commute that’s unmanageable. Most college students will hate the idea of living at home when they complete their college degree. We understand it’s a complete turn-off. You want your freedom when you’re at college and your independence. However, you have to decide whether that’s worth the financial debt you’ll face after you finish. Another option to consider is having a few roommates. Living with five or six people is financially easier, as you can share costs. College isn’t just about learning, and you would be wise not to forget this fact. There are parents out there who would love if their kids focused on classes and avoided going out at college, completely. However, if you do this, you are probably going to burn out pretty fast. Unfortunately going out and other recreational activities are expensive. So what’s the solution here? Well, budgeting is key, and you should watch how much you’re spending each month. Have a fixed amount that you can spend and don’t go over it. You might also want to look into getting an interest-free credit card. This is going to make those costs a lot easier to manage. They can build up on the card, and you won’t need to pay them off for a year or two. Of course, one of the greatest financial hurdles is working out how to pay off the loan at the end of your college life. We recommend you look into a nonprofit service loan forgiveness. With this type of service, part of your loan will be forgiven, and you should find it easier to pay. Remember, there are plenty of repayment plans to consider when managing your student loan. It’s a burden; there’s no doubt about that. But it doesn’t have to be one that’s long lasting. Lastly, many grads will find themselves on lower incomes than they expected once they finish college. Unfortunately, this is just a fact of life. If you get great grades, you might win your dream position. But you’ll probably still need to climb the ranks. Living on a low income is difficult but possible, without going into debt. Again, budgeting is key, and you need to make sure you’re not spending over your level of income. Even though student fees have tripled in the last few years the number of people applying for university places hasn’t slowed down at the same rate. Rather than easing the pressure on the student financial services some of the problems it faced in the past are continuing. Every year there are always a number of students who receive their loans late for various different reasons. Sometimes it may be through a fault of their own, at others the student services just struggle to deal with such a great demand. Either way, when you’ve got bills to pay not having the money in your account on time can lead to relying on other sources. The first thing to do if your student loan doesn’t arrive on time is check that you’ve got the right payment date.Ensure your application has been approved, you have done everything and been registered at university, as only then will your loan be paid, before getting in contact with the student finance services. If you have and the problem is with them, then applying for a bridging loan from your place of study is a good idea. The purpose of this is to tide you over until your loan arrives and is repaid after two weeks of receiving the full student grant/loan. All that’s required is evidence that you should receive a student loan and a bank statement showing you have below a certain amount in your account. Having to pay for the first month’s rent on your new student flat, bills and internet installation, along with other essential purchases such as books and equipment for your coursebecomes a real struggle if your expected loan doesn’t arrive. For those who haven’t got enough savings, taking out another quick loan is one option. Unlike a normal payday loan, short-term personal loans from Smart-Pig.com have been designed by students for students. Available in 60 minutes means you have near instant access to the funds. Ten days without late payment fees and interest which never rises above 50%, mean paying it back should be affordable for most students when their loan arrives. You may think the moment you set off for university is when your full independence and freedom from your family starts. However, most people still return home every holiday and often move back in after their time studying has finished. It can be hard asking to borrow money as this seems like further relying on them. Borrowing from family or even friends should hopefully result in far fewer interest costs (if any) compared to payday lenders. Plus there’s even more of an incentive to repay on time as you don’t want to ruin these relationships. Paying back your student loan or even just aiding your own kids look after their financial debt can easily be very time consuming. Don’t worry! You can actually pay off any student loan. It will take energy and probably a lot of time. You’ll also definitely need to have a strategy. You’ll need some tips that provide you with the instruments to go from having thousands of dollars of student financial debt to getting debt-free. You might even be capable of doing it faster than you anticipated. But first, let’s talk about just why it is advisable to try to pay off your college loans off earlier than needed. You’ll save some money. Let’s say you have got a $30,000 loan using a 4.5% rate of interest which you pay off over 20 years – you’ll fork out $15,550 in interest. Nevertheless, if you pay it off in exactly 10 years, you’ll save $8,240. If you happen to repay it in 5 years, you’ll save $11,993. That’s sufficient money to obtain an exciting new automobile. Or maybe, based on where you reside, a whole year or two of mortgage payments. Getting rid of your student loan debt additionally will provide you with a lot of liberty – the liberty to adopt a lower-paying profession that you value more, the liberty to travel abroad, even the liberty to accept alternative “good” loans – like a home loan for a new residence. It’s also essential to remember that defaulting on your student loan could have some very serious outcomes; actually, not repaying student loan financial debt could be a whole lot worse when compared to not refunding other sorts of debt. Defaulting on your loans can damage your credit history, rendering it difficult to do just about everything from subscribing to standard utilities to getting your first condo. Your credit balances could very well increase thanks to accumulating interest. Of course, if you have government financial loans, the government could add premiums or simply garnish your wages, requiring your boss to hold back money out of your pay checks and ship it straight to the government. There are times when it is more intelligent to repay different loans before student loans – if you have other personal debt with a greater annual percentage rate, pay that down initially, and it’s a very good idea to create a tragedy fund with a minimum of $1,000 when you start repaying student loan debt. But in addition to that, it is usually honestly beneficial to pay down your current school loans as quickly as possible. It’s not always simple and easy, but it’s manageable.